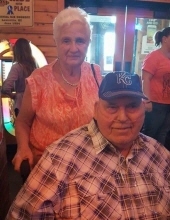 Audrey Arnold, 84 of Adrian, Missouri passed away March 24, 2019 in Adrian. Cremation, with Memorial Services at 11 AM Thursday, March 28, 2019 at the Mullinax Funeral Home (660-679-0009) in Butler. Visitation will be prior to services from 10-11 AM at the funeral home. Memorial contributions are suggested to Heartland Hospice. Messages and memories for the family may be left at www.mullinaxfuneralhome.com. Audrey M. (Mark) Arnold was born June 29, 1934 in Clinton, Iowa, daughter of Ralph Earl and Ethel Mae (Woolsey) Mark. She was united in marriage to Charles Arnold on September 24, 1952. Audrey loved bingo and shopping as well as going out to dinner. She cherished her family and loved having company. She was preceded in death by her parents, her husband Charles; two grandchildren Robbie and Jamie; her brother Norman, and sister Lois. Audrey is survived by her daughter Connie (Steve); son Curtis (Angie); son Chester and daughter Cheryl; grandchildren, great-grandchildren and great-great grandchildren; as well as Patty, Dianna, Karen & Juanita who she and Charles helped raise; in addition to a host of nieces, nephews and friends. To send flowers or a remembrance gift to the family of Audrey M. Arnold, please visit our Tribute Store. "Email Address" would like to share the life celebration of Audrey M. Arnold. Click on the "link" to go to share a favorite memory or leave a condolence message for the family.